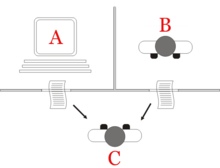 The "staundart interpretation" o the Turing Test, in that player C, the interrogator, is gien the task o tryin tae determine if player A or B is a computer or human. The interrogator is leemitit tae uising the responses tae written questions tae mak the determination. The Turing test, developed bi Alan Turing in 1950, is a test o a machine's abeelity tae exhibit intelligent behaviour equivalent tae, or indistinguishable frae, that o a human. ↑ ""Machines Who Think", on season 4 , episode 3". Scientific American Frontiers (simple; en). Chedd-Angier Production Company. 1993–1994. Archived frae the oreeginal on 2006. This page wis last eeditit on 1 November 2018, at 23:38.